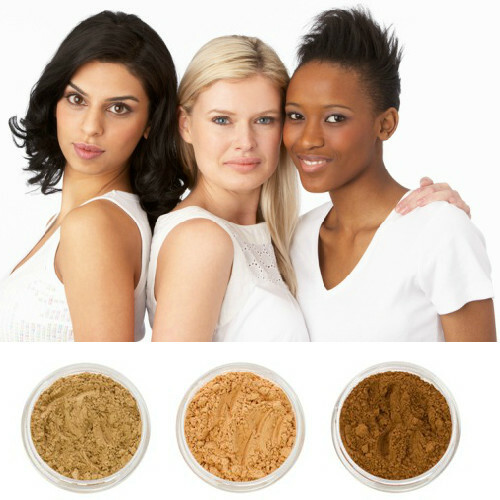 No matter what your skin tone, always purchase a shade that closely matches your own natural undertones. Many women have been advised by the commercial makeup industry for years to use another shade to change their natural color. This suggests it will correct your skin tone or any flaws associated with it, with the idea you are making yourself appear more beautiful. Women with olive skin in particular have been pushed toward using shades with more reddish orange, supposedly to change the sallow or ashen appearance. The fact is, olive shades are pretty much non existent in commercial brands of makeup so they force you to choose something other than your true shade. It is also suggested pink shades should be used to tone down yellow skin. All these different shades will do if they aren't a correct shade match, is make your skin tone appear odd to those looking at you. Your skin will appear to be a lovely shade of orange or pink only, whereby you are not enhancing your beautiful complexion with incorrect shades like these since they aren't remotely close to ones' natural skin tone. The aging effect this causes to the finished look is unsettling to the user. When Olive skin for example, is matched truly with an olive shade, the results are nothing short of breathtaking! Doing Your Mineral Makeup The Right Way! Mineral makeup foundation should only be used to even out and correct facial imperfections, tone down redness or too much yellow, while giving a nice flawless canvas to work with. Love and live with your skins' natural undertones and overtones and compliment it through shading choices with mineral blush, bronzer, lip color and eye color, and always let your own natural beauty shine through. Simple Advice: Think in practical terms; if you apply a mineral foundation that doesn't match your natural skin color, it won't improve it or really even change your undertone. You will only appear to everyone around you, you have simply applied the wrong shade of mineral makeup, and then you are back to looking like you are wearing a mask. Even with mineral makeup, you don't want your face to possess a line of demarcation between jaw line and neck by choosing the wrong color. Another reason to always carry your blending technique all the way down onto the neck and / or to the decollete area if necessary. Again, this is the primary reason to use mineral powders since they will provide you with an even skin tone, mirroring your natural undertones, while allowing "you" to shine through, only with more natural, healthy looking skin. Learn more on how to Find The Right Foundation Shade.